There are hundreds of baby swings on the market but fact is, different babies like different swings. You can’t determine your baby’s preference before using it. But you can make a decision based on what features , bells and whistles you want, how much space you can allow for the swing to occupy and of course your budget. 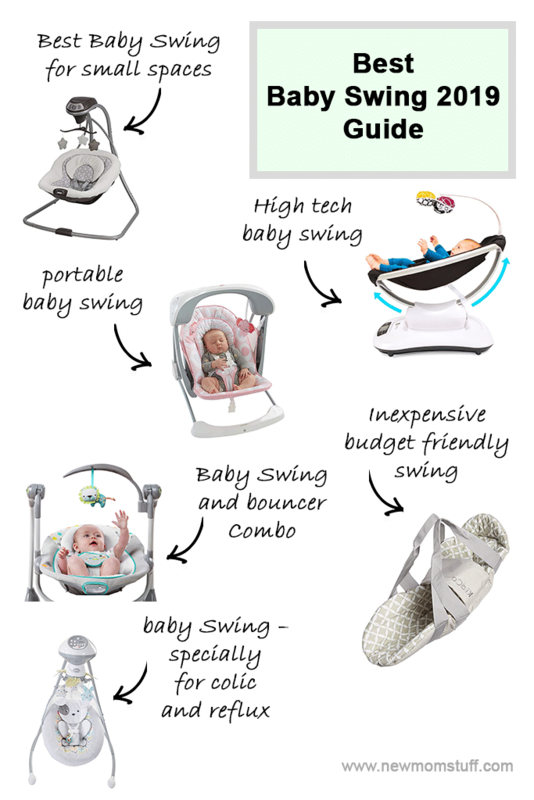 To give you a helping hand we have reviewed and selected best baby swings for every need. Perfect for apartment and high-rise dwellers, the Simple Sway Baby Swing from baby stuff powerhouse Graco is designed to maximize every square-inch footage of your home. 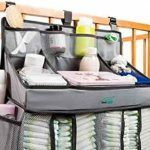 Sleek and compact, it can fit in parent-child shared bedrooms or in small nurseries with little legroom to add with a crib. Simply plug it into an electrical socket and voila! 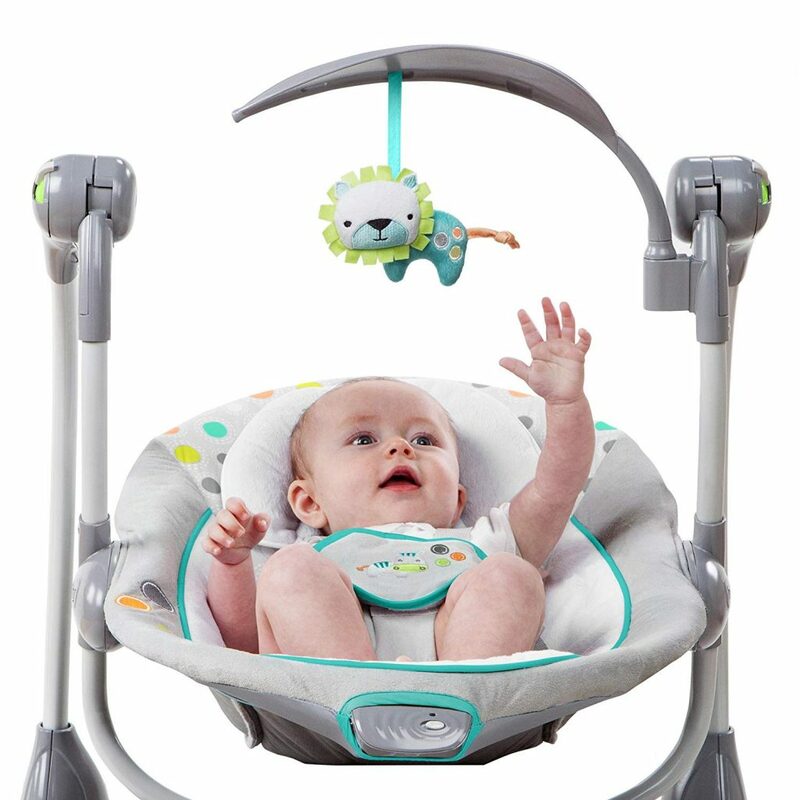 Your little bundle of joy can enjoy relaxing side-to-side swaying motion which can be adjusted with a 2-speed vibration option and 6 swing speeds. Plush seat offers snug comfort for baby and safety with its integrated harness. Add to that 15 lullabies and your baby will be off to Neverland in just a few minutes of swaying. Choose between Abbington or Stratus type here. Head support is not great but adding a car seat head support gets the job done. When on speed dial ensure green light is on else the swing isn’t really on and won’t swing. Here’s what a mom had to say: “I couldn’t put my baby anywhere or in anything without him waking up 10 minutes later. I was getting so tired and couldn’t get anything done around the house… until I bought this swing!”. Read more reviews and feedback here. Built for busy Moms, the 4moms mamaRoo is as high-tech as a swing can be. Engineered to mimic a mother’s soothing motion when cuddling a baby, the infant seat bounces and sways to lull a baby into utmost relaxation. 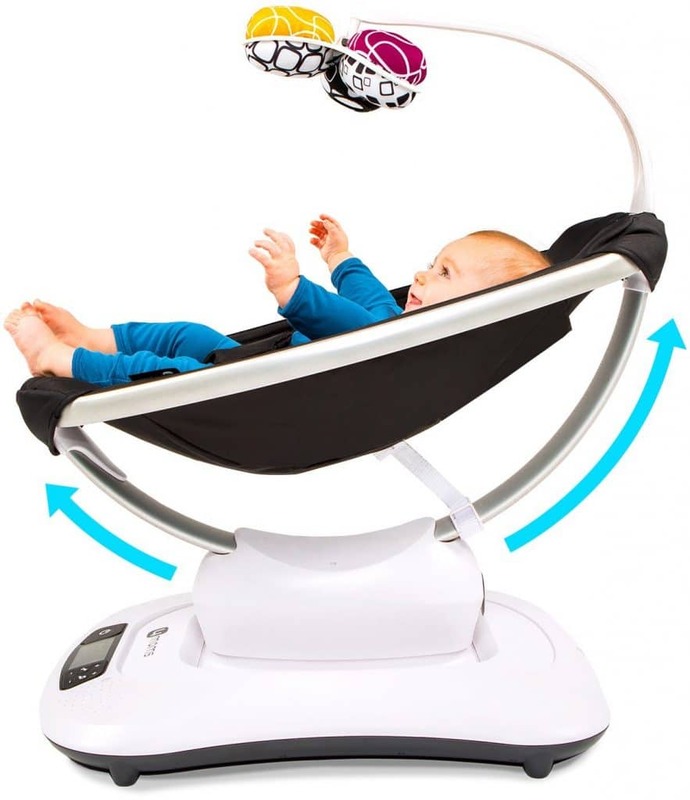 It features multi-angle recline position, 5 unique motions with 5 different speeds and a built-in sound machine that plays lullabies intended to stimulate a baby’s brain. Or you may simply add it to an MP3 player for more song choices. Because it’s Bluetooth-enabled, you can control such features via a smartphone or tablet. As your baby grows, its grasp, hearing and eyesight can be developed with the mobile overhead toys. Seat fabric is ultra comfy with its washable velvety material. If you got the classic black model and want to add more charm to your tech-savvy baby swing then, simply add to cart this reversible and machine-washable swing insert also from 4moms (see details here). You can control it from your phone bluetooth by downloading the 4moms app. You can connect your music player to it, or use the built in sounds. It has essentially no base, meaning it sits on the floor. Here’s what a mom had to say about this high tech swing: “This thing is expensive but it’s giving me about 3 hrs a day right now with my hands free so I can get a couple of things done without a baby freaking out in the background. Hard to put a price on that.” Read more reviews here. Going on a family picnic or a camping trip and want to tag Boss Baby along? 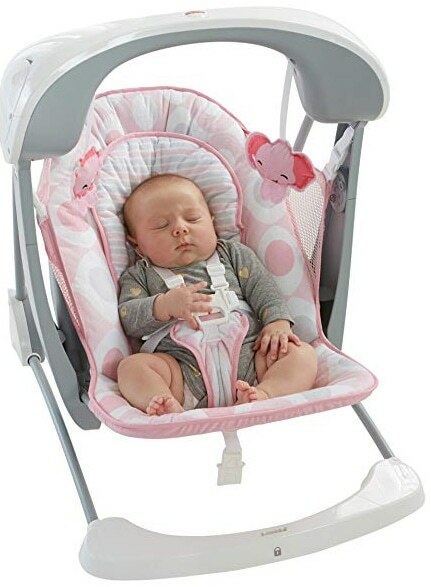 Simply snap-on this Fisher-Price Deluxe Take Along Swing & Seat and you can have baby enjoying the trip with less hassle when it’s time to rest and sleep. 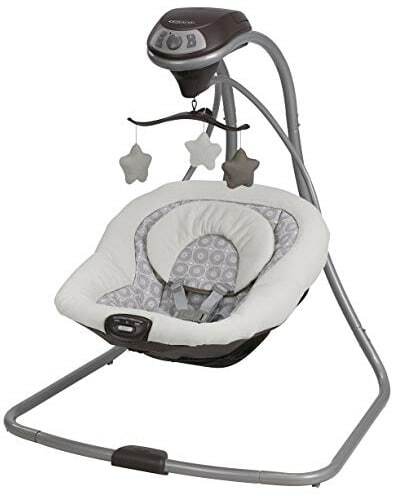 Designed as both an infant seat and a swing, it features SmartSwing technology exclusive to Fisher-Price with 6 swing speeds, calming vibrations, and 12 soothing sounds and lullabies. The seat comes with an ultra-soft newborn insert which can be removed and machine-washed. Sleek and compact, you can snap it close and stash in your car’s trunk without any hitch. Unlike the typical $30-$40 swings you find in Target or Wal-Mart, it senses baby’s weight and folds very compactly to put in your car trunk or back seat. Comes with six swing settings starting from barely moving to nice momentum. The bottom of the swing comes with a buckle, that, when not in swing mode, can be attached to the front of the swing , and act as a seat. Feedback from a user: “My baby goes back and forth to grandparents and Mommy’s home so I needed something portable. I’m so glad I ordered this”. Read more here. Looking for a bouncer and a swing? Now, you can get the best of both worlds with the Ingenuity ConvertMe Swing-2-Seat Portable Swing. You can let a baby play to its heart’s content with the vibrating infant seat and then, have it relaxed to the fullest when in swing mode. Designed with Whisper Quiet technology, one can’t hear any squeaky disturbance when lulling a baby to sleep. Instead, it can be adjusted via its 5 auto swing speed and gentle lullabies or nature sounds to mask any noise outside. This swing-seat sensation also features a toy bar and a removable headrest as well as washable ultra-plush fabric that deliver utmost comfort to a baby. It is also driven with both battery and electricity. You can choose from a Ridgedale, Orson or Seneca model here. Comes with a timer selection option which is great because with it being on battery, you don’t want to accidentally leave it on all night and drain the battery. Depending on baby’s need you can lay it flat or sit it up. 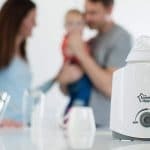 “We bought this when our son was about two or three weeks old. He is three months old now. We didn’t have a sleeping issue” – Read more review here. On a tight budget? Fret-not. 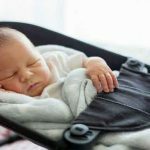 The Swingpod Infant Portable Swaddle Swing is one of the most affordable portable baby swing there’ll ever be in the market. 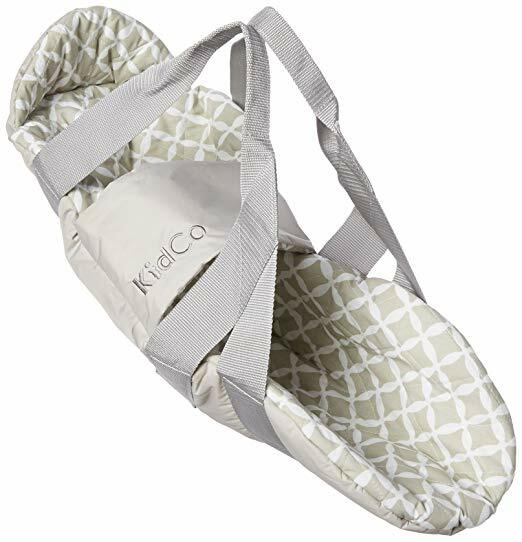 Designed to work against colic, it combines the soothing comfort of a swaddle blanket and the relaxing motion of a baby swing. It can even be used as a changing pad and infant bed when out and about. Now, you can finally say adieu to colic with an affordable and portable Swaddle Swing. It makes a good gift item also. You can easily transfer a sleeping baby from one place to another without waking him or her. The swaddle swing soothes and calms a baby pretty fast. A mom’s feedback: “Really handy to use when going for walks. We would even use it at restaurants, once he falls asleep we could lay him on the table.”. Learn more what other moms have to say about it. For babies who are colicky and prone to spitting up, finding the right swing can be a challenge. Fortunately, the Sweet Snugapuppy Dreams Cradle ‘n Swing by Fisher-Price does the job! 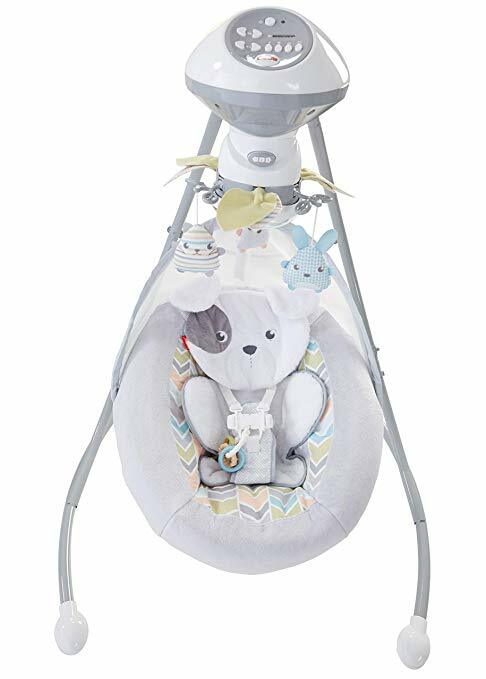 It features double swinging motions (side-to-side and head to toe), adjustable swing speed, and plush ‘n comfy washable puppy seat that cradles a baby in utmost comfort and relaxation. 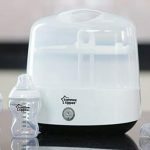 Simply plug it into a socket, set the swing speed, and let baby doze off to la-la-land after feeding time without worrying about colic and spit-ups. It also comes with 3 cuddly friends and a mirrored dome to stimulate a baby’s grasp and sight as well as integrated sounds to relax a baby. Check out other amazing features here. Most babies like to watch the mobile and the mirror in the center. It’s big and takes up a lot of floor space. It is not something that you can move from room to room or travel with. Here’s what a satisfied mom had to say about it: “This thing is gold! We have a colic 3 month old baby who cries and cries when we put him down. We broke down and ordered this last week. It came on Friday and he’s been a heavenly baby ever since. “ Click here to learn what other moms says about it. Hope this baby swing guide has been helpful. But remember a swing is no substitute for human contact. Some experts recommend limiting swing time to an hour or less a day when your baby’s awake. However there is no doubt that a swing is a must have baby gear that can provide you with much needed hands free time.